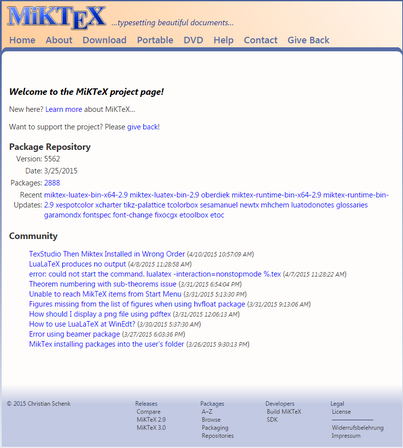 MiKTeX (pronounced mick-tech) is an up-to-date implementation of TeX and all programs for Windows. It is a type of book system that gives you a lot of mathematics. MiKTeX is a publishing system focused on a set of mathematical formulas. It has a huge number of features, including packages for creating drawings, presentations, tables, etc. Most of the world's leading publishers who publish journals in mathematics, physics, computer science and calculus. technology (computer science) accept articles and monographs ONLY in the tex format (see, for example, Elsevier, Springer). Add. Information: In this distribution there are packages MiKTeX 2.9.6850 complete 32 bit and 64 bit (as of 11.10.2018) (new! ), Miktex basic 2.9.6850 32 bit and 64 bit (new! ), Miktex portable 2.9.6753, and also accompanying software: Ghostscript 9.25 (new!) and GSview 5.0 (with a tablet) - programs for working and viewing in vector formats .ps and .eps, TeXnicCenter 2.02 - a wrapper for TeX, literature and manuals on some packages, as well as utilities for Transformations from Word to LaTeX and vice versa (note that the latest versions of the utilities without a tablet and the version of 2007 with a tablet were included in the composition; the utilities without a tablet are fully functional the first 10 times), recommendations create mirror updates. Beginners are encouraged to start learning TeX with the help of K.V. Vorontsov "LaTeX2e in examples"! 4. Start TeXnicCenter, set it to let MikTeX install InstallDir \ miktex \ bin (usually C: \ Program Files \ Miktex 2.9 \ miktex \ bin), PDF reader, etc. This method can also be used with the Portable version.